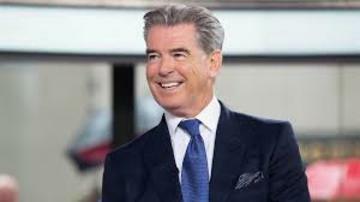 Pierce Brendan Brosnan OBE is an actor, film producer, and activist. In addition to being an Irish citizen, Brosnan is a naturalized American citizen. After leaving comprehensive school at age 16, Brosnan began training in commercial illustration, then went on to train at the Drama Centre in London for three years. Following a stage acting career he rose to popularity in the television series Remington Steele (1982–1987), which blended the genres of romantic comedy, drama, and detective procedural. After the conclusion of Remington Steele, Brosnan appeared in films such as the Cold War spy film The Fourth Protocol (1987) and the comedy Mrs. Doubtfire (1993). In 1994, Brosnan became the fifth actor to portray secret agent James Bond in the Eon Productions film series, starring in four films from 1995 to 2002 (GoldenEye, Tomorrow Never Dies, The World Is Not Enough, and Die Another Day, He lent his likeness for Bond in the video games GoldenEye 007, James Bond 007: Nightfire and James Bond 007: Everything or Nothing, providing his voice for the latter. During this period, he also took the lead in other films including the epic disaster adventure film Dante's Peak (1997) and the remake of the heist film The Thomas Crown Affair (1999). Since leaving the role of Bond, he has starred in such films as the musical/romantic comedy Mamma Mia! (2008), the Roman Polanski-directed political thriller The Ghost Writer (2010) and the action spy thriller The November Man (2014).